MORE THAN 10.000 CONCERTS IN THE WHOLE WORLD - MORE THAN 5 MILLIONS ALBUMS ANDCD SOLD - 3 DIAMOND DISCS, 7 PLATINUM DISCS AND ABOUT TEN GOLD DISCS - IN THE SEVENTIES JEAN-CHRISTIAN MICHEL IS N° 1 IN FRANCE BEFORE THE BEATLES ! Jean-Christian MICHEL has invented a unique musical style, inspired by a whole culture of classical music (notably the Sacred Music of JS BACH and a sophisticated Jazz. He is one of the founder of the "Classical-Jazz" Crossover, with the famous Jazz pianist John LEWIS and the drummer Kenny CLARKE from MODERN JAZZ QUARTET, and some others brilliant musicians. Today the music of JEAN-CHRISTIAN MICHEL is still evolving. Calling on the multidimensional sounds given by modern technology, the composer has created "JAZZ & SACRED MUSIC CROSSOVER", a futuristic music with spatial echoes, which remains warm-hearted and grandiose. Strict in its structures, the musical art of JEAN-CHRISTIAN MICHEL is just like the universe which it irresistibly recalls : harmonious, ample and timeless. Reaffirming in the modernity its prodigious emotional power, the music of JEAN-CHRISTIAN MICHEL takes his listeners on strange star-splashed journeys. Jean-Christian MICHEL, brilliant composer and exceptional virtuoso, invented a highly original style between sacred music and black American music. 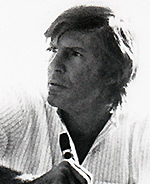 He worked interpretation at the highest level with Guy DEPLUS clarinet teacher at the National Conservatory of Paris. Jean-Christian MICHEL has played with the biggest names of world jazz from Mezz Mezzrow at Peanuts HOLLAND, Bill Coleman, Kansas FIELDS, Kenny Clarke, Duke Ellington. 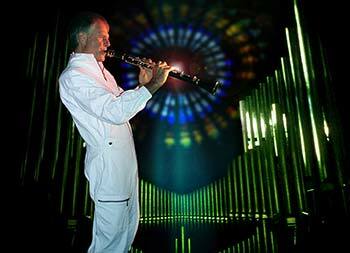 "Jean-Christian MICHEL appears in a symphony of colours and lights, dressed in his white spatial overall. His talent on the clarinet and his magnetism reveal an unexplored musical universe". Previously well known for his J.S BACH JAZZ arrangements , his version of Aranjuez's concerto and his own works, Jean-Christian MICHEL, today projects a new imagination in churches and cathedrals. Monique thus is a pianist, an organist and a piano teacher in the "Cité de la Musique" in Marseilelle, France. She has worked with Jean-Christian MICHEL for more than 40 years ! A deep friendship and understanding link them in their concerts as in life. 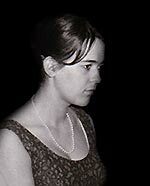 She earned first prize in piano, organ, music theory and counterpoint at the Marseille conservatory. She was a pupil of Pierre COCHEREAU. She is qualified as a "national teacher of Conservatoy" and is organist at the Basilica of Notre Dame de la Garde in Marseille. She is globally recognized as one of the great interpreters of J.S BACH on the organ. Her distinguished playing is clear, precise and imprinted with an extraordinary musicality. Every recital begins with this call from the known towards the the unknown. Then one can listen to a strange music of which one did not even suspect the existence, so much is it difficult to define. When Jean-Christian MICHEL plays, he seems to find the notes beyond himself, in the "other dimension". He restores, throughout his recital, this mysterious force drawn from the infinite, and knows how to share it with a wonderful sensitivity. The special sonority of his clarinet fuses with the resonances of the organ, in the virtual transparence of synthesizers brilliantly played by Monique THUS. (*) Because, of course, JEAN-CHRISTIAN MICHEL calls on real concert artists to exploit the beauty of the sublime sounds which he is using. Jean-Christian MICHEL has given many concerts with famous choirs, notably that of Saint Eustache in Paris, during a series of ten concerts at the "Champs Elysés" theatre. Recently he has performed with internationnaly reputed regional choirs, and these concerts have enjoyed an enormous success. • Jean-Christian MICHEL has composed completely new works for choir and orchestra. Scores and CD on request. Here he performs with the Balory choirs. Jean-Christian MICHEL's concerts and laser shows express depth and space featuring Clarinet, church organ and computer-controlled synthesizers. A universe of translucent sounds and luminescent lasers : nights of clouds and lightning, green diffracted beams, ceilings of heavy phosphorescent purple clouds create a gulf of obscurity from the beginning of time. The audience finds itself totally enchanted and involved in this spectacular show of faerie constructions and holograms. Jean-Christian MICHEL's concerts and laser shows are an unmissable experience, because photos can only give the weakest outline of this strikingly original and grand dream-reality. The interstellar concert of Jean-Christian MICHEL is a dreams in the stars : a giant-screen video backprojected, continues amazing interstellar images. It evokes a space trip in which stars, planets, meteorites jets and mysterious spheres integrate with musical themes. This show takes the audience into the secret of galaxies. It reveals the sacredness of the cosmos, and the obvious link between music and universal harmony. The flow conducting music vibrates in the strange stellar deep resonance, and connects the powerful breath of the stars to the beauty of the melodies. A magical and mesmerizing dream to awaken at least once in his life! JEAN-CHRISTIAN MICHEL's GRAND OUTSIDE LASER and FIREWORKS SHOW and ENCHANTED WATERS LASER SHOW use the latest in high-tech sound, lighting and special effects. - Concerts of living, cosmic music for a majestic sound and light show, where glowing infernos and incandescent meteors mix with the springs and gigantic fountains of lit-water rising to lay siege to heaven in an unprecedented show. LASER CONCERT WITH WATER SCREEN - CONCERTS IN "NATURAL CATHEDRALS"
Jean-Christian MICHEL's works. Arrangements of J.S BACH, and of contemporary composers - Aranjuez's Concerto. Jean-Christian MICHEL's team assures a sound of the highest quality and lighting with electronically-controlled special effects, which gives the show an unusual dimension for a concert. Computer-controlled synthesizers allow the audience to hear CD quality sound, but naturally with much more presence and an incomparable expression of emotion. YOU WISH TO ORGANISE A CONCERT ? CONTACT US ! please write, e-mail, or phone.